A fabulous guest book is the ultimate wedding keepsake. 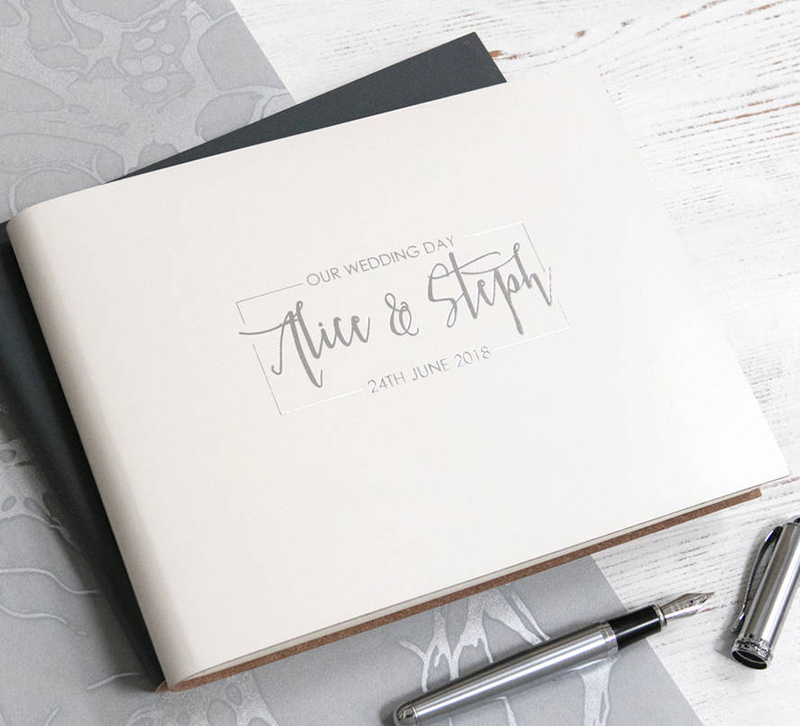 Our wedding guest book ideas are perfect for your big day. Over the last year, we’ve seen so many absolutely fantastic wedding guest books. We love guest books just as much as guests love signing them and couples love keeping them. 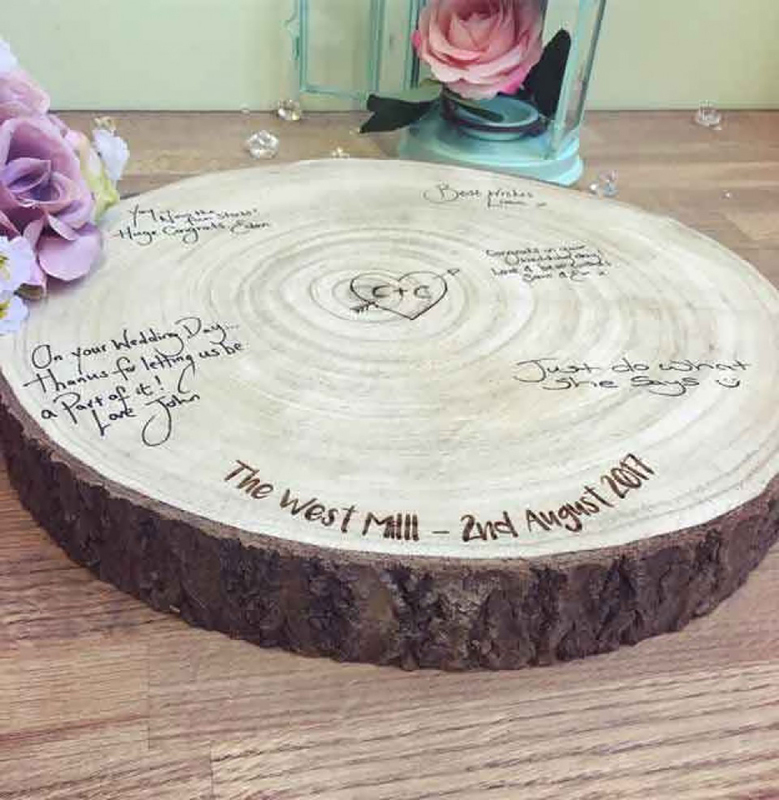 They are one of the very best wedding keepsakes and there are so many guest book ideas to choose from that you can be sure you’ll be able to choose something that works perfectly with your big day. 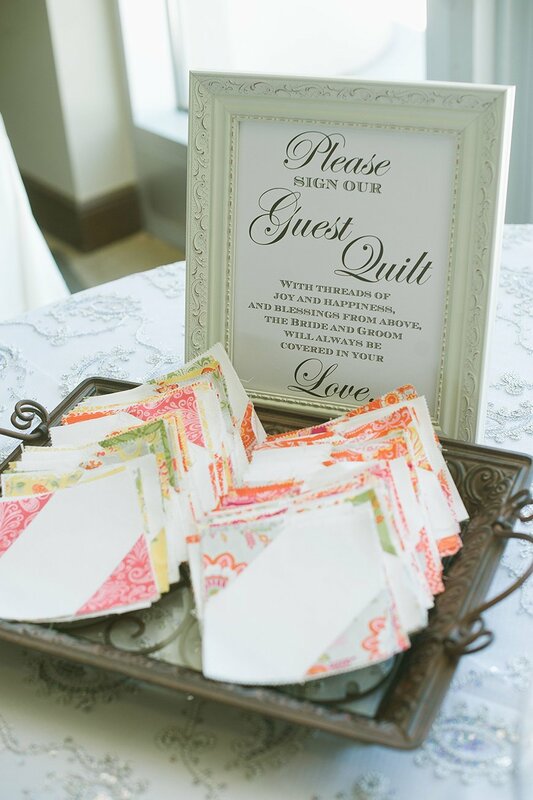 Here are the wedding guest book ideas that you won’t want to miss. 1. Create a message in a bottle guest book that you can open over the coming five years. 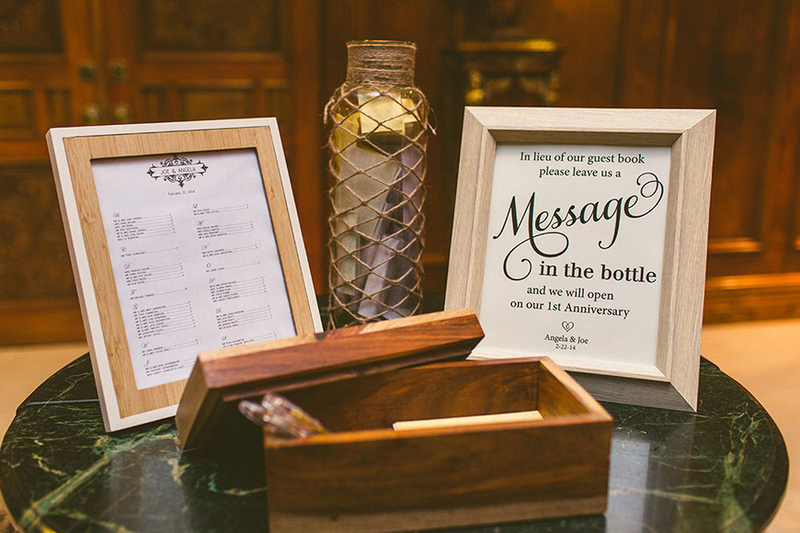 Guests choose which bottle to slip their message into and then all you have to do is keep the bottle until the contents are ready to read! 2. We love calendar guest books! 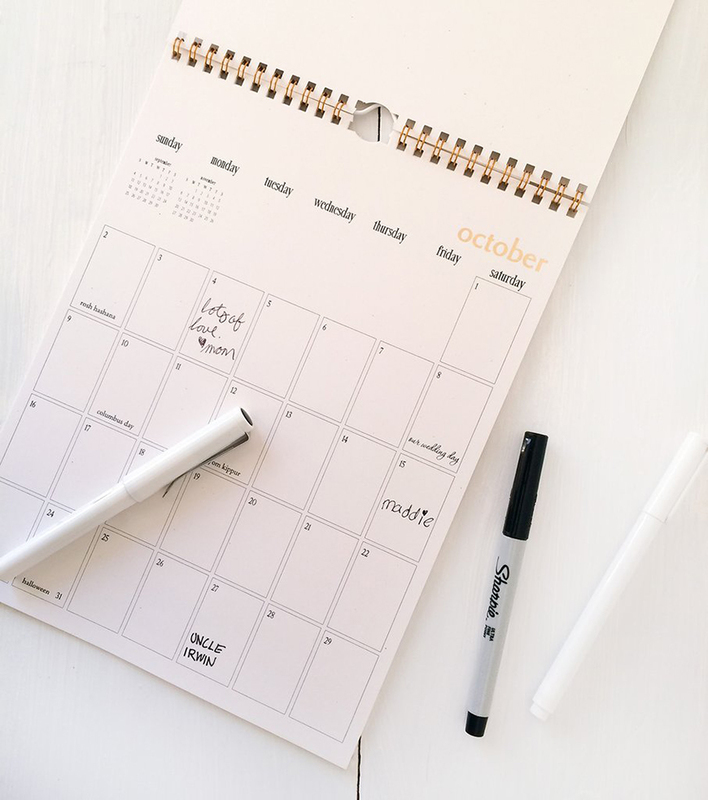 Create a personalised calendar online for the coming year and then ask all your guests to sign their names on their birthdays! You won’t forget a date and all your friends will be with you over the next twelve months. 3. 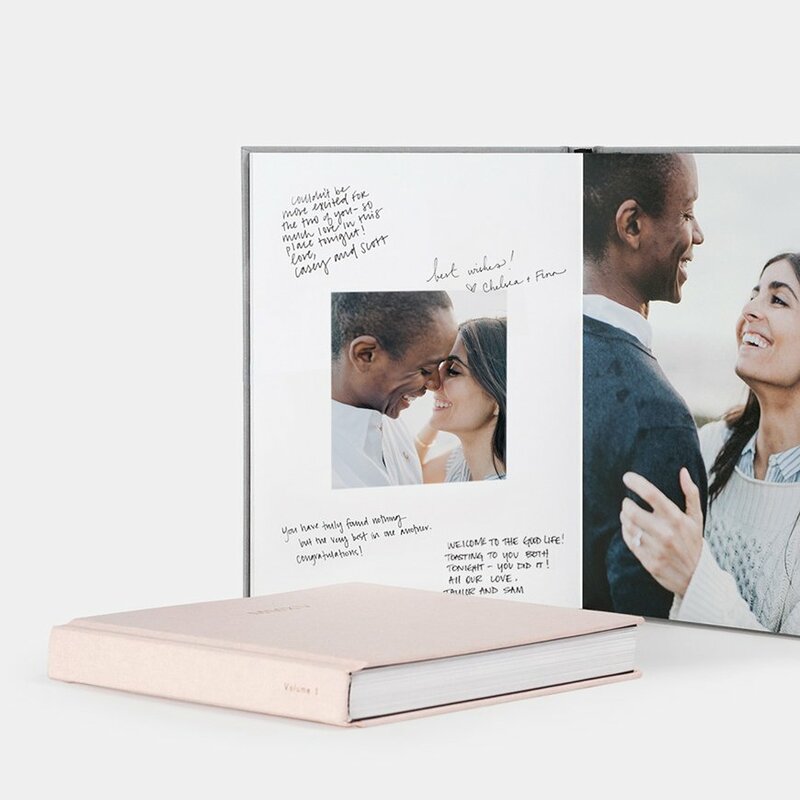 They say that some of the best things in life are worth waiting for so how about a guest book that you only get to read on your first anniversary? 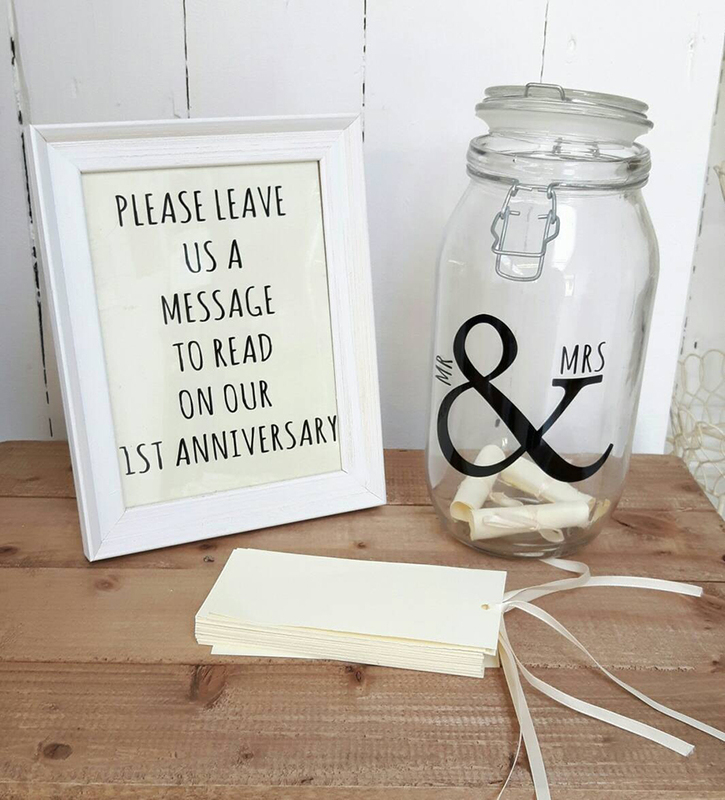 Guests leave their messages in the jar that you only open as part of those anniversary celebrations. 4. 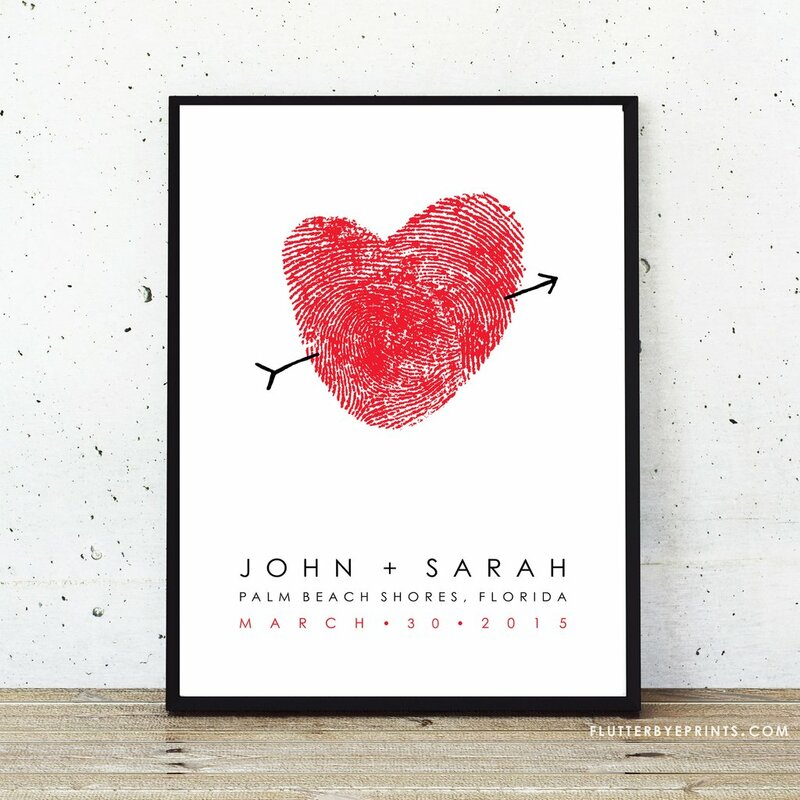 Create a unique piece of art by using your thumbprints! You can be sure that no one else will have a guest book quite like this, especially when all your guests have left messages for you. 5. If you want to opt for a more traditional guest book, make sure that the book in question is absolutely gorgeous. Commission a handmade book that works with your theme (and let guests add photos too). 6. A video guest book is a lot of fun and it doesn’t need to be complicated either. 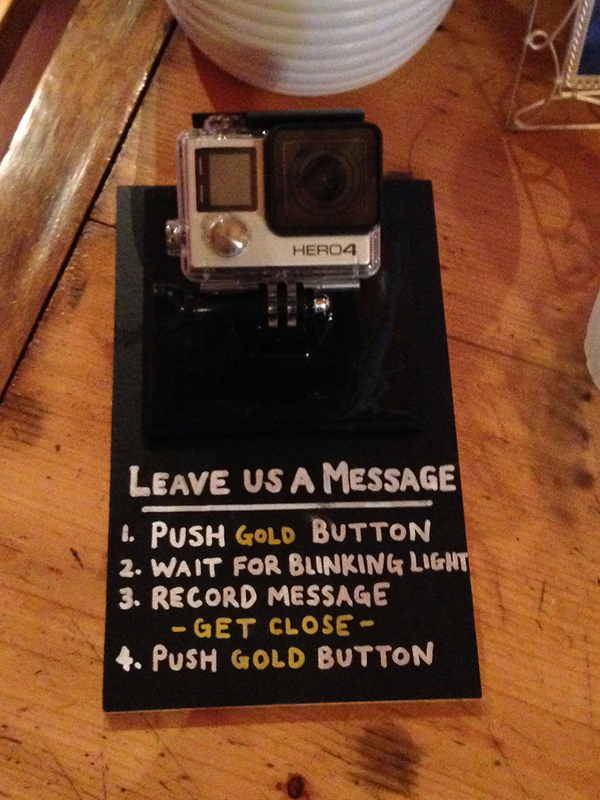 Set up a small camera and ask everyone to record their messages for you. We can guarantee that this is one film you’ll both enjoy watching! 7. 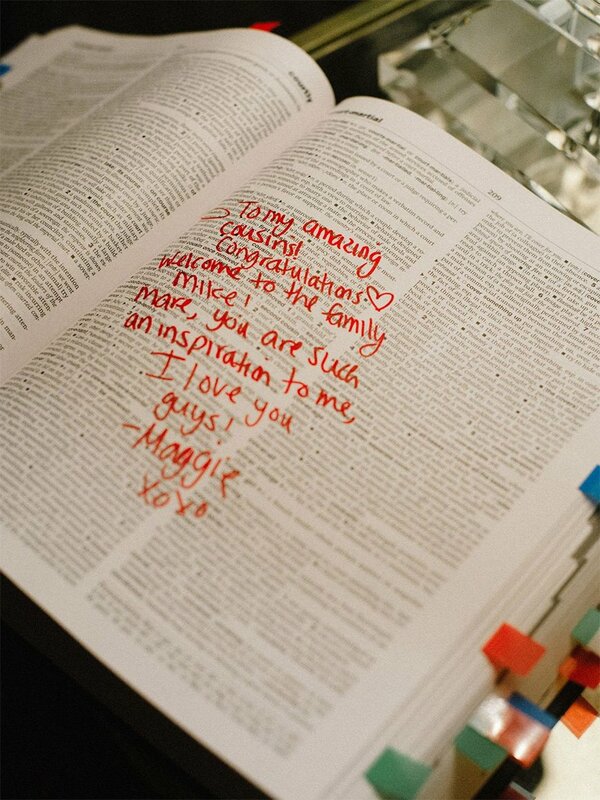 Dictionary guest books are a LOT of fun. Ask your guests to find a word in the dictionary that they associate with you and then ask them to leave their message for you on that page. You’ll keep your guest book on your book shelf forever. 8. 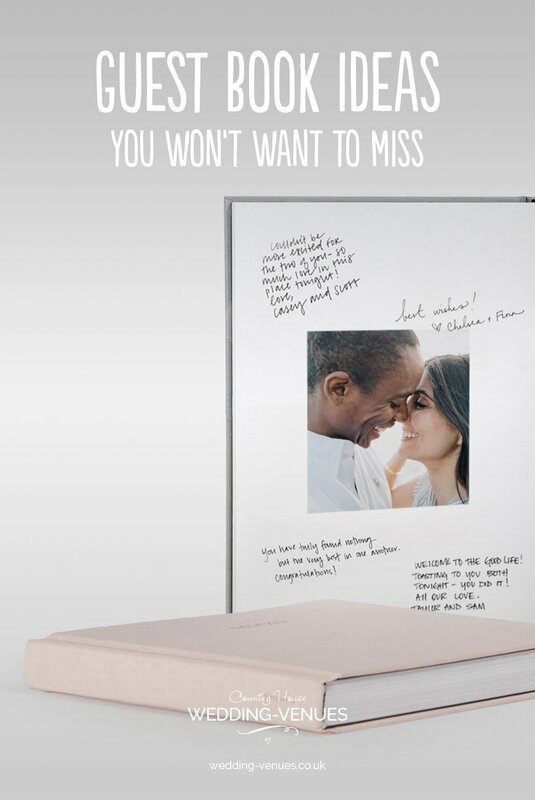 Choose your favourite photo from your engagement shoot and turn it into your guest book! Print the image on a large canvas and ask guests to add their signatures before you display your personalised artwork at home. 9. 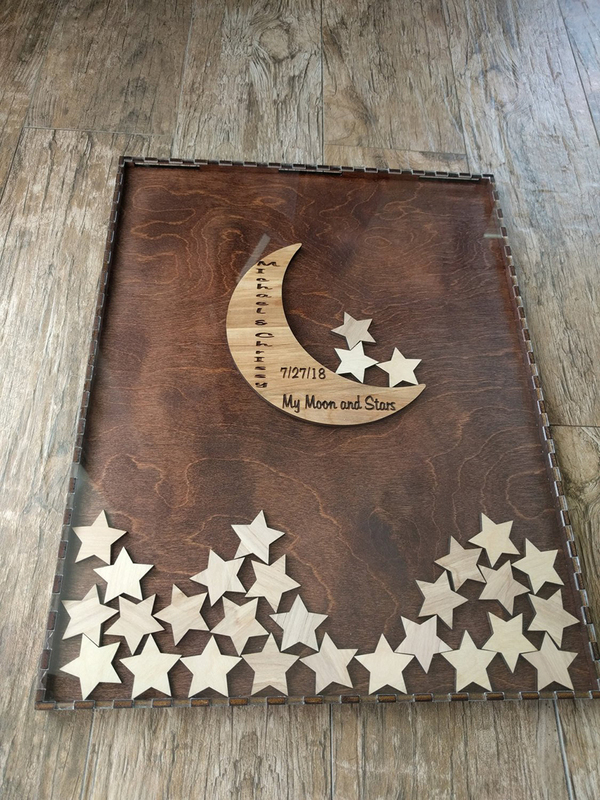 If you love your partner to the moon and back, a moon and stars guest book is a must-have. Guests sign a wooden star and slip it into the frame to fill the sky with stars for your both. 10. 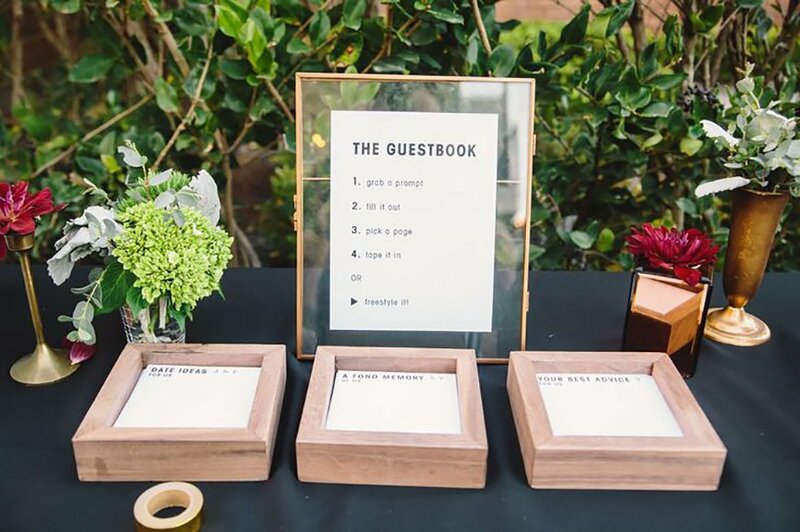 Find out what your guests really think about your with your guest book! Ask everyone to fill in a prompt card so they can recount their favourite memory of your both, talk about your best attributes or even give you some advice for the future. 11. Make sure married life is always cosy with a guest book quilt. Set out lots of fabric squares for everyone to sign and then make (or have them made!) into a quilt after your big day. 12. 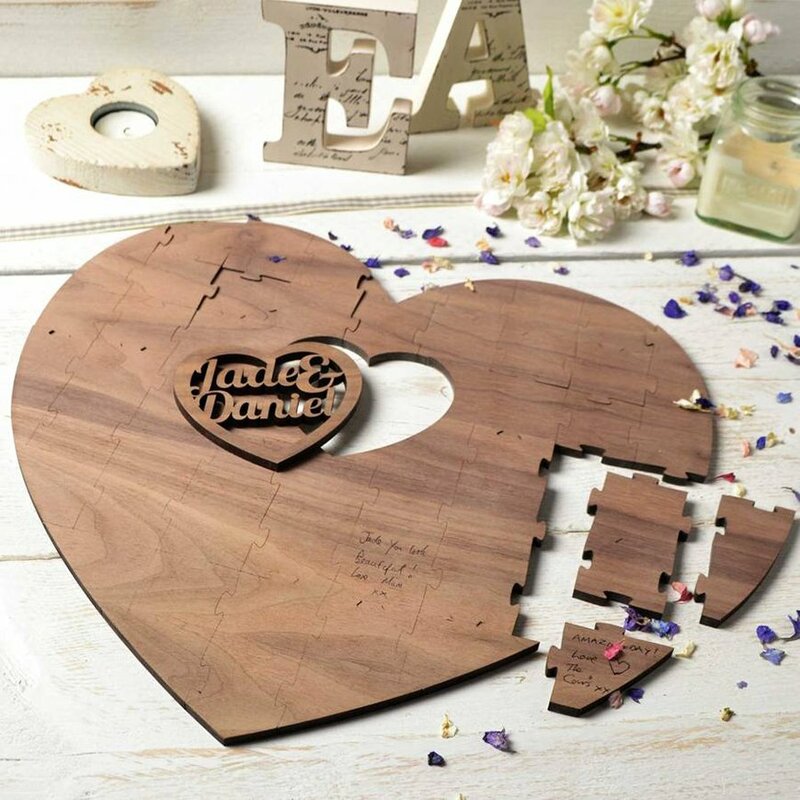 If you love a puzzle, then you absolutely have to create your own guest book jigsaw. Set out lots of blank pieces for everyone to sign and then try to puzzle it out. This guest book idea is a lot of fun! 13. Guest logs are perfect for rustic weddings. Once everyone’s signed the wooden slice, coat it with varnish or a sealant so it’s perfectly preserved. 14. 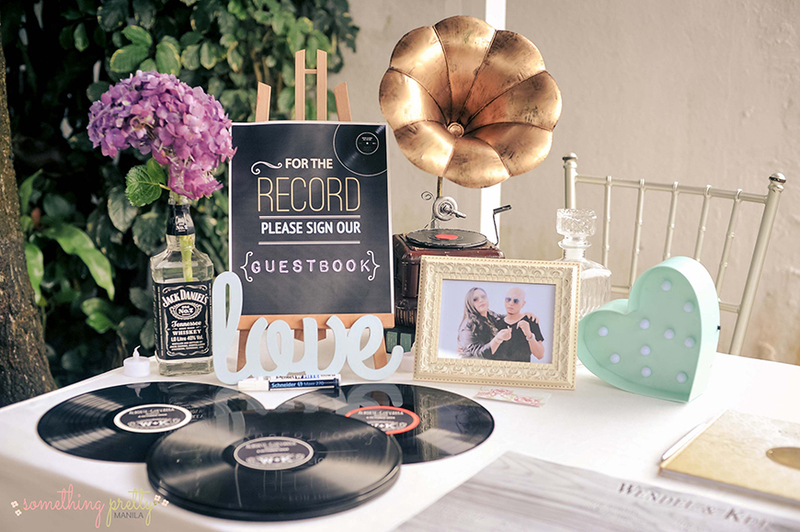 This is one for all you music lovers out there – ask guests to sign your favourite vinyl. For a romantic touch, why not use a copy of your first dance song? 15. Our final guest book idea can really help you build memories. 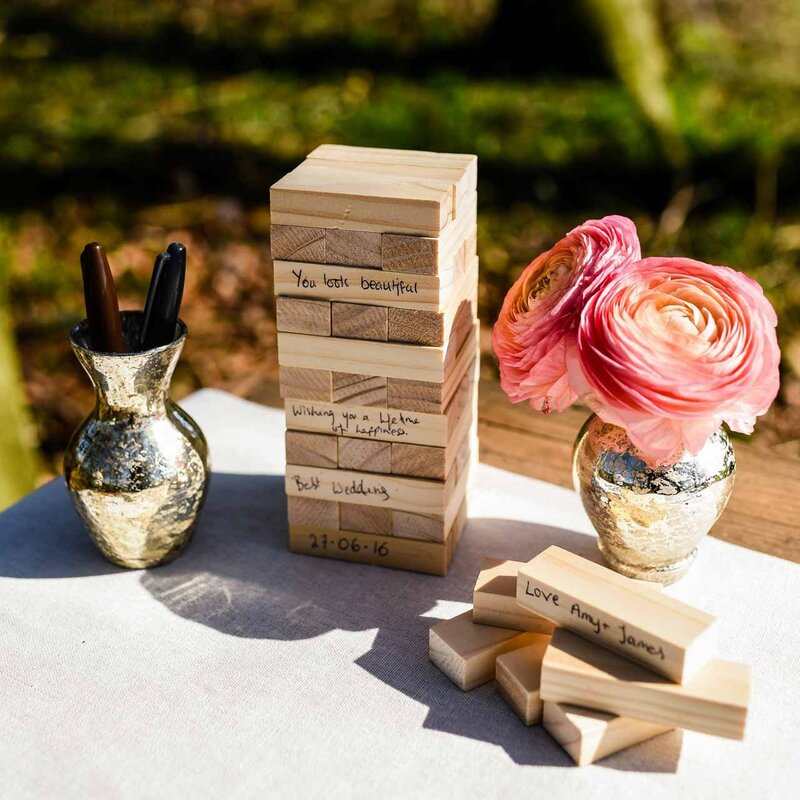 Encourage guests to sign Jenga pieces that you can keep for years to come. For another personal touch for your wedding, custom invitations are a brilliant idea. Take a look at these fantastic ideas for illustrated wedding invitations.